Thank you, thank you to The Boy Trifecta for this amazing tutorial! I am so loving this bag. It's genius! I must not have paid enough attention to the tutorial when it came to the purse strap, but if you make this bag, be sure to shorten it...it was too long for me. I just tied a knot in it for now, which actually works with this bag, I think. Maybe I'll fix it the right way, but this works for the time being. I highly recommend making one of these bags...it's not as daunting as it looks. Enjoy! This looks awesome! And I should add something about making the strap the length you want it...I don't think I mentioned it in the tutorial. LOVE your fabric choices! Super cute bag! 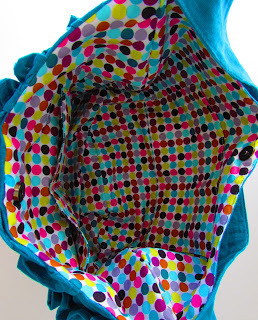 I absolutely adore the polka dot fabric and would love to make a bag of my own with it. Could you tell me who the manufacturer/designer of the fabric is? Thanks so much!